Get Visual Business Solutions was engaged by the Apex Downtown Business Association (ADBA) to evaluate and quantify the demographic characteristics of the market area for Historic Downtown Apex, North Carolina. The ADBA had been promoting and facilitating a revival of the downtown area over the past 5 years–in conjunction with local government, the Apex Chamber of Commerce, and other local organizations–and the results were very positive. Downtown Apex became a lively destination for people seeking to enjoy an eclectic mix of unique retail, dining, arts, and entertainment. This was particularly surprising given that the Triangle, North Carolina, and the U.S. had experienced a severe economic downturn when business activity in Downtown Apex really took off. The ADBA was seeking quantitative information to understand the size and character of the market area, and use that information to promote Downtown Apex to potential businesses and enable them to create solid business plans. It was assumed that most people who shop and dine in Downtown Apex travel there within a 5-mile radius of the downtown, with more potential customers (but less frequent visitors) coming from within a 10-mile radius. The target demographic of shops and boutiques in the area, based on anecdotal observations of shop owners and ADBA Board members, was estimated to be females age 35-54. However, many of the festival goers and dining patrons ranged widely in age and included an equal proportion of males. Since there was no common source of primary data on customers–most small businesses didn’t collect and tabulate such information–population data were tabulated for 10-year age groups to lend flexibility in analyzing various target demographics. 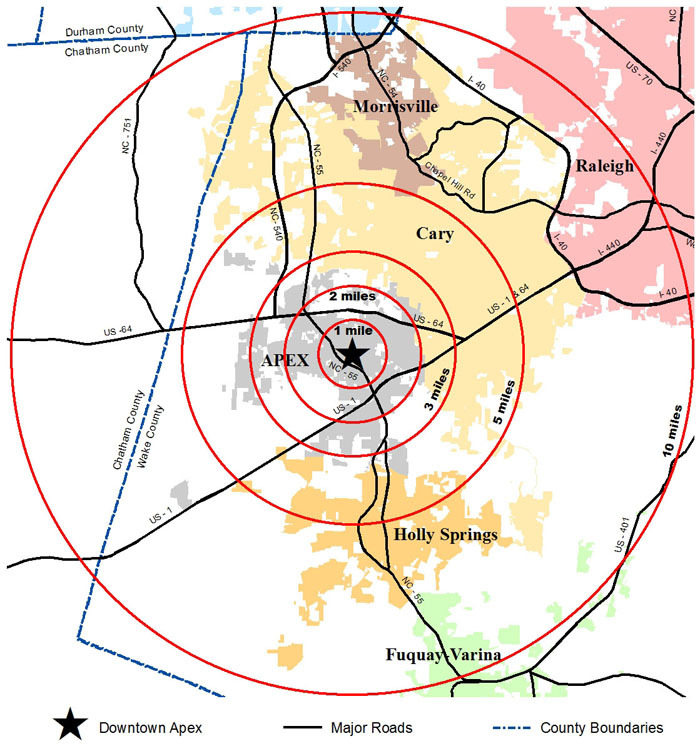 Total population, persons in 8 different age groups by gender, presumed “target” shopping populations, percent college graduates, and median household income were tabluated for areas within 1-mile, 2-mile, 3-mile, 5-mile, and 10-mile radii of the intersection of Chatham and Salem Streets in the middle of Downtown Apex. The population data were summed from U.S. Census blocks, while education and income data were summed from U.S. Census tracts. The block data were obtained from the 2010 Census, while the education and income data were from the American Community Survey 2005-2009 5-year estimates. Data were attached to GIS maps of the area and tabulated visually using a base map and aerial photographs as reference information. A GIS-generated map showing municipalities and major roads in the area, along with the location of Downtown Apex and the various radii, are shown on the map below. The associated tabular data are shown in the table below the map. As we typically mention in these analyses, Get Visual can perform this type of analysis for any area in the United States, large or small. Demographic data can be assembled from any collection of geography, including counties, zip codes, tracts, and more. The Downtown Apex market area is well-populated, with a total population of over 300,000 living within 10 miles. The market area population is also very affluent, with roughly twice the median household income and educational attainment as that of North Carolina and the United States. This illustrates, at least partially, why Downtown Apex has fared so well since 2005. In addition, the analysis indicates that Downtown Apex has an opportunity to attract many more shoppers and festival-goers than it has thus far, given the size of target populations identified within sort travel distances, and considering current levels of attendance at downtown events throughout the year.